I joined a new book club recently to try and read YA books that I normally wouldn't pick up. I really want to expand my literary horizons this year and since I'm writing a YA novel, I want to read as much, and a lot of diverse YA, as possible. 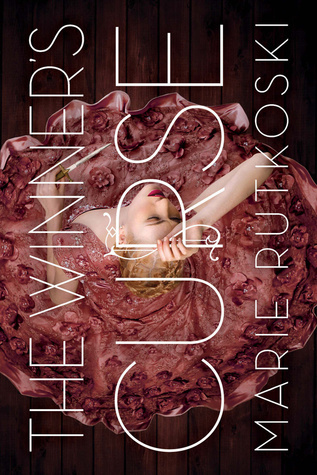 This is how I ended up reading The Winners Curse by Marie Rutkoski - I always loved the dress on the cover of the book but was never really motivated to buy it. Until now. So that summary from Goodreads sounds like it's a one in a million young adult book. Boy and girl. Some weird world. Unfair relationship. Blossoming love. Difficult choices. Blablabla - I've read a handful of books like that before and I only started reading YA fantasy a few months ago. However, what it says about the book is that it's impossible to create a blurb that does it justice. I tried to make a better summary, but I just couldn't think of anything that can really explain the book. At the core, it is just that summary with all the elements you have seen time and time before. But when you read it, it's so much more. And that's mostly because Kestrel is not like other YA narrator. Kestrel is not strong. Kestrel does not have any superpower. Kestrel is basically just a normal girl who is stuck in a difficult position. Some might argue that Kestrel is extremely intelligent, but I don't think that's even the case. She's just smart enough to know how to survive, yet she doesn't do anything really extraordinary. Kestrel is brave and stands up for what is right and that doesn't always end well for her, which is so refreshing compared to the female YA characters that can defeat everyone and everything - it doesn't always work like that and it doesn't work like that for Kestrel. Besides the fact that Kestrel is surprisingly normal for a fantasy narrator, the romance is also so much more realistic than the average YA book romance. Usually, it all goes VERY fast and it's intense - it either ends perfectly or it ends horribly. No in between. However, in the Winner's Curse, there is a middle ground. Both Kestrel and Arin realise the difficulties that come from a relationship where one person is in power and one isn't at all (as slave, Arin really has nothing to say) and neither of them try to gloss over it. It's a real issue and the book takes the time to really explore what that issue means for both of the characters. So basically, this book takes all the cliché YA fantasy elements and just gives them a little twists. You'll still recognise all the things you love to read in another YA books, but the story surprises you with all the twists and turns it takes. This book won't ever be one of my all time favourites, probably because fantasy just isn't my favourite genre, but it was a very enjoyable and surprising read so four out of five stars.